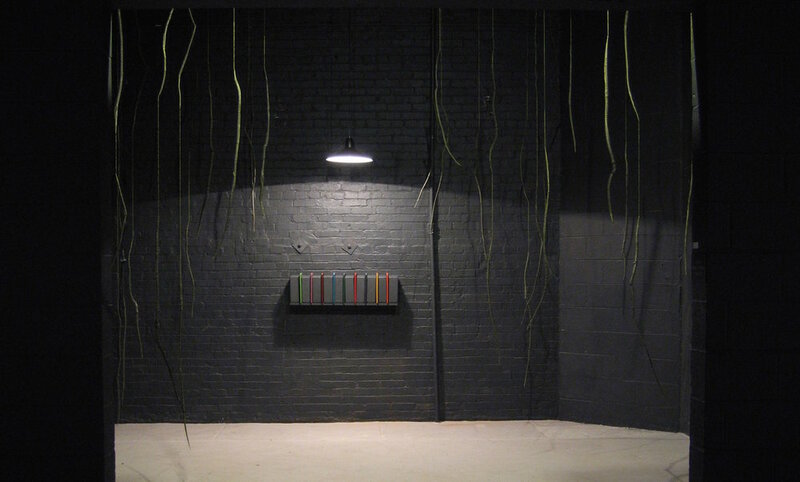 Building was a site-specific installation designed as a reading space for a series of personal sketchbooks. Each multicolored book contains a suite of mixed-media drawings that layer imaginary and photographic landscapes. The space is hung with sculptures made from twigs that I whittled to a point at each end, painted black and entwined in a delicate crochet of neon filament. By creating a space within a space I wanted to take the viewer on a journey that mimicked the artistic process. Building was created for Perspectives: a CFEVA exhibition at the Icebox Project Space, Crane Arts Building, Philadelphia, PA, 2008.